The practice of matrimony has been around in some form or another for thousands of years, so it’s safe to assume your wedding and event business has some longevity to look forward to. Below are five tips to help your wedding barn business find a happily ever after of its own. Whether people are searching for wedding and event venues or a new place to grab happy hour nearby, they will undoubtedly turn to an internet search. Make sure your business is well represented on the internet with an attractive and informative website. Splurge on a custom build or DIY with web-design services from sites like Squarespace—with so many accessible options, there’s no excuse! Wedding day pictures are worth thousands of words—and thousands of dollars, as well! More than anything, prospective clients are looking to understand how your event space can transform into the perfect wedding venue. Make it a priority to spring for high-quality photos that will spark excitement and imagination in brides and grooms to be. Whether you’re personally on social media networks or not, your business needs to be. Maintaining a social posting schedule can seem like a daunting chore, but there are plenty of low-maintenance ways to stay present in followers’ feeds. Allow your guests to be a part of the online conversation with reposts and hashtags, and use that killer photography you paid for to push promotions and tell stories. Who knows, you might even find social media to be fun! Some clients will want to plan their entire wedding by themselves, and some will be looking for a little or a lot of help. Either way, customers will appreciate that you are thinking about how to connect them to relevant resources. Build relationships with other vendors and find ways to collaborate on packaged service offerings. This probably goes without saying, but always make sure your clients are happy with what they are paying for. A little communication can go a long way, so don’t be afraid to show your guests you care about their special day by making sure they are content throughout the process. When people are happy with the service they receive, they are more likely to leave positive reviews, tell their friends about your services and bring their business back for the next event. Word of mouth is one of the most trusted and effective marketing tools, so make sure people are saying great things! Ready to take your wedding and event business to the next level? 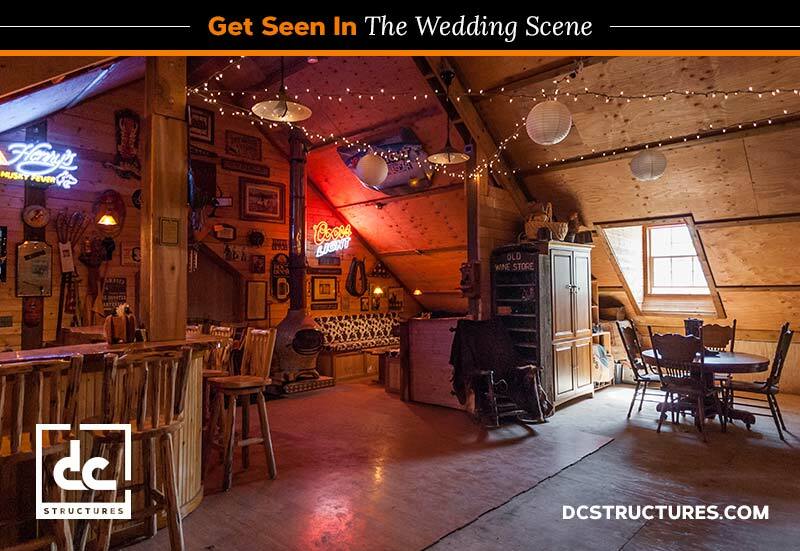 Request a digital catalog to get started on a wedding barn today!